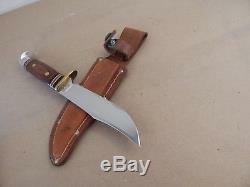 Here's a vintage Western Hunting Knife with sheath that was made in 1986 and was never used. It's in MINT condition. Made during the years when Western was owned by Coleman and the sheath keeper snap has their mark. 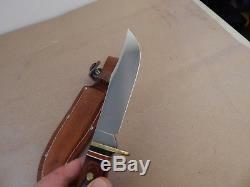 Measures 10.25" overall with the blade being 5.5". Marked WESTERN USA 36 J. 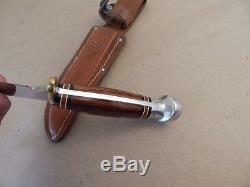 Thick brass guard and laminated rosewood handles. 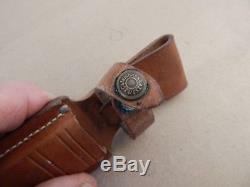 Nice original leather sheath shows no wear. 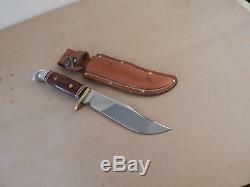 The item "MINT 1986 vintage WESTERN USA W36 J HUNTING KNIFE withsheath" is in sale since Tuesday, May 8, 2018. 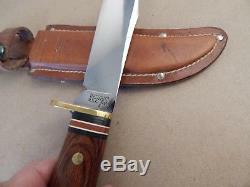 This item is in the category "Collectibles\Knives, Swords & Blades\Collectible Fixed Blade Knives\Vintage Fixed Blade Knives\Factory Manufactured". The seller is "gardyne-vermont" and is located in Derby, Vermont.